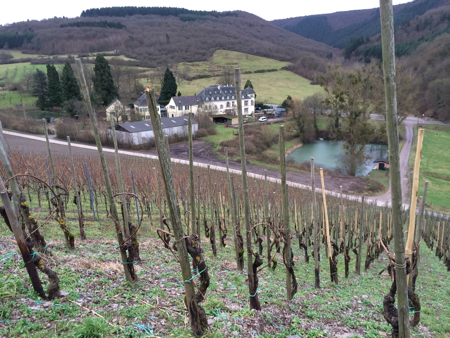 A view of the Scharzhof from Egon Müller's core old-vine block called "Dem breiten Weinberg." When I translated Franz Irsigler’s article on the Scharzhof, I became curious about the biographies of Jakob Koch and Anna Maria Clomes. For many years, I have been an amateur genealogist, so I could not help but do the research in the National Archives in Luxembourg, the Trier Diocesan Archives, and the State Archives of Belgium in Arlon. According to Dean Schauffler’s parish chronicle and the registry on the Benedictines in the Trier Diocesan Archives, Jakob Koch was born in Prüm (in the Eifel, 63 km or 39 miles north of Trier) in 1762. In the baptism records there, we find a pair of twins—Joes Jakobus and Anna Maria, children of Franz Josef Koch and Maria Magdalena Reineri. The parents had married on February 10, 1755, and before the twins were born, they had baptized their daughter Maria Magdalena in 1758. The mother died in January 1769, and the father remarried Susanna Reymundus the following year. The second marriage only lasted for three years. Franz Josef Koch died in November 1773. At the age of 11, Jakob Koch was an orphan. So far, the records are silent about his whereabouts for another 11 years when we find him in the Benedictine register: he was ordinated subdeacon at St. Mary’s in Trier (Kloster St. Marien) on March 27, 1784. The subdiaconate was the first higher ordination and implied celibacy and practice of canonical hours. Then followed ordination as a deacon in March 1785 and priesthood in April 1786. Thereafter, there is another eight-year gap in our Benedictine father’s biography. In late July 1794, all clergymen and women in the Trier region had received permission from the Archbishop-Elector of Trier Clemens Wenceslaus (the man behind the so-called Riesling-Edikt of 1787) to leave their monasteries. On August 9, 1794, the French army arrived in Trier and the occupation started. The French very quickly transformed the abandoned monasteries in and around the city to hospitals, and we know from a contemporary diary that by December, St. Mary’s housed wounded soldiers in every possible corner. So, it was practically impossible for the monks to return there. Franz writes—and on this point he probably follows Schauffler—that Jakob Koch was the prior of St.Mary’s. This is not confirmed in the register of the Benedictines in the Trier Diocesan Archives. Further, he also writes (in a footnote in the German original) that in the letter of request from 1795 to reverse the sequestration, Jakob Koch is listed as number 15 out of 16 monks. This would support the Müller family’s version, as told by the wine critic John Gilman, according to which Koch was the youngest member of the monastery and had been left behind when the senior monks fled to the right bank of the Rhine. By studying the Wiltingen church records and the register of parish priests, Weltklerus, in the Trier Diocesan Archives, it is possible to establish that during the autumn of 1794, at least three new priests arrived. According to Schauffler, the incumbent parish priest Franz Flanders was old and ill and could make use of some assistance from other priests. Flanders was born in Trier in 1723 and had been the pastor of Wiltingen since 1769. Typically, the assistance was given in the first instance to name chaplains to the parish. In December, we find the first mention of Nikolaus Sircker (1770–1843), who did not stay long, because in early 1795 he was sent to Nittel on the Upper Mosel. Then there was the newly ordained Matthias Mathieu (1767–1834). He stayed as a chaplain till 1803, when he became the parish priest of his native Grevenmacher. On October 15, 1795, Jakob Koch actually signed an entry in the Wiltingen church records as a chaplain (sacellanus) for the first time. This is at least a year earlier than what Schauffler states in his chronicle. It is clear that Schauffler did not consult the parish records on his predecessors for his chronicle. Subsequent writers have also copied him on when Flanders passed away: he claims in 1797. But according to the parish records, Flanders died on November 7, 1800. His death was recorded by his successor Johan Peter Reget (1771–1829). We should note that Koch was never appointed parish priest in Wiltingen. Maybe he was the vicar at one point. The records tell us that Koch continued to serve as a priest in Wiltingen until at least September 22, 1800, when he recorded his last baptism. In a civil ceremony, he married Anna Maria Clomes in February 1801, just a couple of months before the birth of their first child, Anna Leoba. The proposal was accepted by the administration, and citoyen Koch de Viltingen was appointed a municipal agent of the Canton Grevenmacher for Wiltingen on March 12, 1798. On June 30, 1800, he was appointed mayor. Despite these appointments, Koch carried on his mission as a priest, as mentioned above. The various records can give a little bit more information on the family of Anna Maria Clomes. As Franz writes, she was born in Bastogne in 1775, which was then a part of the Duchy of Luxembourg, today situated in the province of Luxembourg in Belgium. She was the eldest daughter of the lawyer and notary Jean Baptiste Clomes and his wife Anne Marie Pesché. They were both from the nearby German-speaking part (quartier) of the Duchy and had moved to French-speaking Bastogne as adults before their marriage in 1774. Just like Jakob Koch, Anna Maria Clomes lost her father at a young age. He died in 1788. As the eldest daughter, she probably had to leave the family early and work in other households. Her mother did not remarry until 1800 and then to a widowed day laborer in Wiltz, situated in today’s Grand Duchy. Amongst the sponsors of the Clomes-Pesché children’s baptisms in Bastogne, we find one parish priest from Redange, which could indicate that the family had some ties to the Church. It could very well be that a clergyman organized the position for Anna Maria Clomes as a housekeeper (domestica) with Father Flanders. We do not know when Anna Maria found her way to Wiltingen, but we find her in the parish records as a godmother (matrina) at a baptism there for the first time on September 7, 1794. She must have been well established in Wiltingen, since she was called to stand as godmother on several occasions till 1800. We can conclude that both Jakob Koch and Anna Maria Clomes had very limited means before the purchase of the Scharzhof. They had both lost financial support from their respective families at a young age and were most probably obliged to leave their homes than to make a living on their own. Jakob Koch had been under vows of poverty till at least 1796, when the Benedictine order was dissolved in Forêts and could not have had any savings to speak of. If we prudently follow Belva’s lowest estimate from 1808 of the Scharzhof’s yearly turnover (below: t/o), which was at 15,000 francs (25 Fuder at 600 francs each), we can see that it was quite enough to cover the maturing bonds and yearly interest costs, since these peaked at 1,212 francs in 1799 and diminished to 1,060 in 1802. As I have shown in my other article, Jakob Koch needed “only” to pay down 505 francs cash within 10 days after the auction and another 505 francs six months later. The remainder of the credit to be reimbursed in cash could very well have been served from the yield of the property. According to John Gilman, the Müllers seem to suggest that the purchase was entirely financed by the credit system put in place by the French in 1796. When Koch gave his bid for the Scharzhof, he had been at the estate for almost three years, so he had an insider's view of what it could yield. He probably studied the auction conditions very carefully and found that it was only half of the first bid, which had to be paid in cash. The remainder, up to the sum of the final bid, was to be settled in natura and or services rendered to the Republic. This part was entirely subject to the long-term outlook he had in mind: either the Ancient Régime would return sooner than later, a view held by his old abbot, which would have meant that Koch would return to the monastery; or the Republic would prevail, which would imply for him to settle his debt in full. He already received a rebate in 1799, and by early 1802 at the latest, we must assume that his credit was paid back in full. At any rate, the first two down payments in 1797 and 1798 were far removed from the 8,000 to 9,000 francs that were discussed in October 1806. This gives us reasons to believe that if Koch received any funds at all from the monastery it was less than 8,000 francs. More on the Scharzhof: Per Linder on the Scharzhof transaction. Please, can you help to translate | explain what “scharz” mean – in englifh, deutsch ou bien francais??? Hi Mats, the term schartz means “cleared woodland” (see “How the Scharzhof Came into Private Hands in the Early 19th Century”). Daniel Deckers, editor of the Franfurter Allgemeine Zeitung, mentions in an article, published in October 2013, that Jacques Koch’s wife Anna Clomes was a nun. This explains her presence in Wiltingen and why she, as a relatively young stranger, was called to be a godmother at baptisms there.